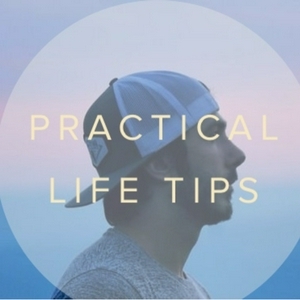 Simple tips, tricks, and hacks for a life well lived. A simple Apple Watch trick to save battery and make sure you get a good night's rest. You can find generic versions of all kinds of stuff on Amazon for a fraction of the cost, but similar quality. Get frugal today. Nothing worse than grabbing a pint of ice cream out of the freezer and then realizing it's rock hard. Power Naps - The Right Way! Power naps are great, if you use them correctly. Just beware, sleep inertia! If you have an Apple watch and you don't know about this shortcut, you are not living your best life. I dare you to get out of your comfort zone and take on this challenge. I guarantee you'll be better for it. Pack minimally, organize better, and easily unpack with the magic of packing cubes. One of the worst feelings is overeating - the food was good, but now you feel like trash. Avoid that with this simple tip. Up your photo game with this incredibly easy tip that anyone can do in seconds. It's easy to throw shade at Monday, but you're just ruining your own week. Flip it this week and be a Monday Lover. One of the beautiful things about technology is that we can use simple apps like Instagram to push our own limits and expand our universe. Get out of your comfort zone with a few taps. Upgrade your stories and stop boring your audience by adding some sort of interaction or journey to your stories. Learn quick tips on getting your images to fit perfectly into Instagram stories or using custom templates from an app. Don't let those live photos go to waste, learn how to get the most out of them with Instagram. Season II kicks off with how to get the most out of Instagram stories - a nice easy, soft theme to get PLT geared back up! The title sounds like a fluffy tip, but this is actually very practical. Start planning your morning before you call it a night. Also some great call-ins! This great tip is from my friend @los - it's a solid way to nurture new relationships or keep up with older ones. Don't wait until January 1 to start your resolutions, start today! Also some great call-ins! Cultivate a spirit of giving. Everyone thinks giving is easy, but it's not, you need to practice it like any other skill. GET FESTIVE W SPECIAL GUESTS! I welcome three amazing guests to the podcast to share their holiday tips. Check out what Dann Petty, Sloth aka Timmy Ham, and Andy Vitale have to say. Use this often forgotten about feature on your phone to create room in your life and to cut down on end of day stress and anxiety. Saying no can be scary and intimidating, but it also brings a sense of freedom. Say no to more. Pull the trigger and get rid of all those old emails! Drop some TSwift and make some moves towards inbox zero! This week we're going deep on productivity so you can have more time with friends and family over the holidays. PLUS our first giveaway and a little more about me, @morewillie! Every weekend I share all of the call-ins from you! All the tips, feedback, and stories 😊 You guys make this station great! Winter is here and you're probably not getting enough Vitamin D, let's fix that! With winter here, we get colder, drier air which makes it even more important to drink enough water everyday. HYDRATE. Don't rush meals - slow down when you're eating and enjoy the moment. There are some really benefits to slow eating and with Thanksgiving approaching, it's a great time to chill out a bit. My favorite day of the podcast is Saturday because I get a chance to share and respond to all the call-ins and feedback from you guys. Reach out to @morewillie on Twitter or Instagram or use the call-in feature on Anchor to share your life tips or any stories or feedback! Whether youre on a big camera or your phone, upgrading your lenses can make a huge difference in your photo game. More so than the camera body, so get your spending right! So many people don't take the time to really learn their camera (or camera phone). Don't miss capturing a moment because of a dumb mistake, KNOW YOUR CAMERA! This quick tip will not only improve your Instagram feed, but also make your photo editing a lot more efficient. UP THAT 'GRAM GAME! Ep33: The Rule of Thirds! Saturdays are for showcasing the life tips you submit! Use the call in feature on anchor or find me on twitter or Instagram, @morewillie! The concept of paying it forward isn't new, but we don't generally think to do it day to day. Today, or this weekend, surprise someone, pay it forward! Saving a bunch of money can be as easy as picking up the phone, but ugh, phone calls are the worst. Here's how to make it easy. If you want to know how to spend your money to maximize happiness, this is it. Spend money on experiences instead of on things. Put Spare Change to Work! Here's a couple apps that will help you put away money on the side for a rainy day. If you aren't using these, you should be! Great additional tip to Feng Shui your phone and stoked to hear smaller towns and cities have great library access to ebooks! Thanks for the Call-ins! Stop spending so much on ebooks and take advantage of your library's free ebook and audiobook lending 🙌🙌 THE HOTNESS! Sell Your Stuff! Plus Callins! Backup Photos the Easy Way! The benefits of getting out into nature! Be prepared. Think ahead. Do it now. Tips for dealing with ticks! You wouldn't believe how many uses there are for paracord - not just for camping, but in everyday life too. Don't be a Jerk Traveler! MrScottEddy joins us again to share the importance of basic manners when traveling. Don't let stress or the rush of travel make you forget your please and thank you's! In other words, don't be a jerk! Those white, do not ingest packets that you find in all kinds of packaging - those are silica gel packs and they have all kinds of uses. Listen to find out what to do with them! Travel blogger extraordinare @MrScottEddy joins us to share one of his most important travel tips for avoiding the plague. The right way to pack! Make more room in your suitcase, keep your clothes organized, and maybe even avoid some wrinkles with this method. Stop typing out common words and phrases letter by letter! Start using text replacement to give your thumbs superpowers. Use the one minute rule to best procrastination! What's the most impressive thing you can do in one minute?? In a rush, but then you realize you're phone is almost dead? Here's some easy ways to charge it faster. Never miss out on a selfie again. Use an empty sink, bowl, or cup to create a simple, easy amplifier for your phone speaker. Test out different objects and see what works best! Zero days are why a lot of us give up on new skills or commitments, but a little is better than nothing, so don't crush zero days and get on with it! It's the weekend and I want to hear your favorite tips or what you're working on. Find me on Twitter or Instagram, @morewillie and let me know your best tips! Be weekend consistent because if is worth doing Monday through Friday, it's worth doing on Saturday and Sunday. Learn how to enjoy the benefits of cold showers without being freezing and miserable. ToDo lists are great for getting things done - learn how stacking up some quick, easy wins in the morning can supercharge your ToDo list productivity. How many trash emails are clogging up your inbox every month. A couple great methods to unsubscribe from those old newsletters and SPAM easily. Your inbox will thank you.